As with all locks, when you use electronic locks the keys you use to open them are just as important as the locks themselves. The pairings of unlocking and locking devices will both shape the final outcome of your protection. Electronic locks are locked or unlocked with the assistance of an electrical current. These devices will actuate the lock in a manner that is either fail-safe or fail-secure. A fail secure lock will protect your valuables under a power outage, because the lock will not permit the door to open it. A fail safe lock will not protect your valuables without power but will allow you to leave the building. 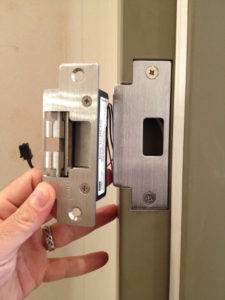 Speak to a professional locksmith in Reno to find out which is optimal for your building. There are a few different types of electronic locks that are available on the market for purchase. The most common electronic locks available are electric strikes, electric latch retraction exit devices, electromechanical locks and electromagnetic locks. Electric strikes provide remote electrical control to unlock a door. 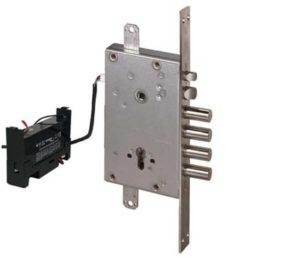 Latch retraction locks are necessary for panic or emergency doors where remote unlocking is desired. Electromechanical locks can be opened with both remote access or with a physical key. An electromagnetic lock is accessed commonly by authentication tokens, radio frequency, access codes and biometrics. Tokens are items like swipe cards where you must use the device within close proximity of the access control lock. Radio frequency works quite similarly but can open the lock from much further away. Another type of key system is the use of access codes. These codes can be anything from numbers, letters, and colors. Finally there is the use of biometrics; the important thing is having a properly calibrated sensor that allows a slight margin for error. As you can see there are many types of keys that can be utilized for keeping your home, business or property secure. Speak with your commercial locksmith in Reno to implement security methods that are going to work for your personal needs. Anything you haven’t considered is something for a thief to exploit. Electronic locks are a big investment, so they may be suited more for a business than a home, but there is no better personal investment than in protecting your property. This entry was posted in Locksmith Tips and tagged biometric, commercial locksmith, electric strike, electromagnetic lock, electromechanical lock, electronic locks, lock, locksmith, locksmith reno, reno. Bookmark the permalink.